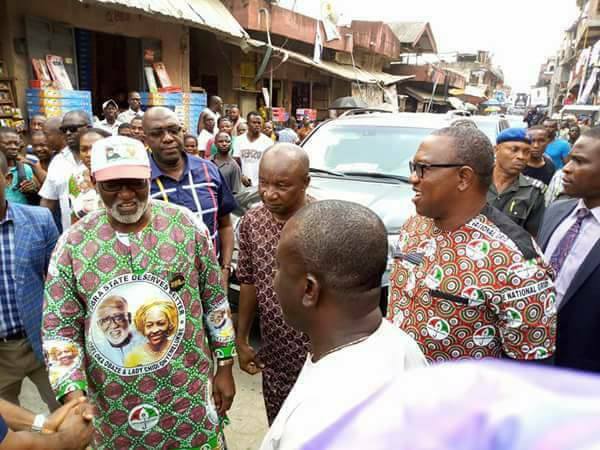 The People’s Democratic Party, PDP’s Vice Presidential Candidate, Mr. Peter Obi, and the Lagos State Governorship Candidate, Mr. Jimi Agbaje, visited four business hubs in the city on Wednesday, assuring traders of a robust economy should their party come into power. Agbaje, who expressed misgivings about the President’s failure to sign into law the new electoral bill passed by the National Assembly, recalled that after the 2015 elections in Lagos, PDP had headed to the Electoral Tribunal, Appeal Court and Supreme Court, which all ruled that card reader machines were compulsory for an acceptable election. He said his case on the 2015 governorship election, in which Mr. Akinwunmi Ambode was declared winner, had been based on the premise that contrary to the INEC regulation, the election had been majorly conducted without card readers and therefore should be declared null and void. However, the Supreme Court finally ruled that although the INEC regulations approved the use of card readers, the method lacked the backing of any extant law. Upon this, he said that the National Assembly passed a law to back the use of card readers that President Muhammadu Buhari had presently refused to sign. Accompanied by the Deputy Governorship, Mrs. Haleemat Busari, and legislative candidates, the PDP entourage received tumultuous receptions when they held town hall meetings with businesses at the Computer Village in Ikeja, Games Village in Surulere, Ladipo Auto Spare Parts Market in Ladipo and FESTAC Town. Obi placed the blame for country’s recession on the government of the All Progressives Congress (APC), whom he charged with lacking capacity to manage businesses. According to him, Nigeria’s problem began when her administration was placed in the hands of people who neither participated in nor understood business and trading. Describing ICT as the future, Obi said that Nigeria’s exchange rate would regain health when the country became an exporter of computer technology. Agbaje blamed the Lagos government for Google corporation diverting to Ghana and Uganda a plan to provide free Wi-Fi in all schools, pointing out that, if the scheme had succeeded, it would have created more business for Nigerians in the sector. He said that it had been proved that when internet use increased by 10 percent, the GDP of the benefiting country rose by 3.8 percent, which he described as a significant addition to the economy. According to him, the current regime in the state had put stumbling blocks of corruption to telecommunications companies and had failed to appreciate the impact ICT would make on the economy of the state. Criticising Lagos State’s current tax system that had given room for multiple taxation, Agbaje assured the business representatives that his government would put in place a tax regime that would eliminate double taxation. Lamenting that there had been no improvement in Ladipo since his last campaign visit in 2015, Agbaje promised that he would not indulge in the current APC’s government rhetoric of threatening to shut down the market, but rather he would improve access roads to and facilities in the market. General Chairman of the Ladipo Auto Spare Parts Market, Mr. Jude Nwankwo, said that the place had suffered neglect from the current regime.